If the AutoRecover option is turned on, you can automatically save versions of your file while you’re working on it. How you recover something depends on when you saved it. Under Versions, click the file labeled (when I closed without saving). In the yellow bar at the top of the file, click Restore to overwrite any previously saved versions. TIP In Word, you can also compare versions by clicking Compare instead of Restore. 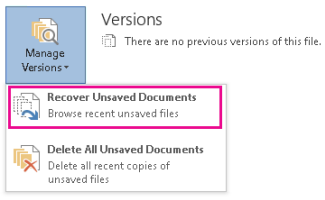 Click File > Info > Manage Versions > Recover Unsaved Documents in Word, Recover Unsaved Workbooksin Excel, or Recover Unsaved Presentations in PowerPoint. Select the file, and then click Open. In the yellow bar at the top of the file, click Save As to save the file.